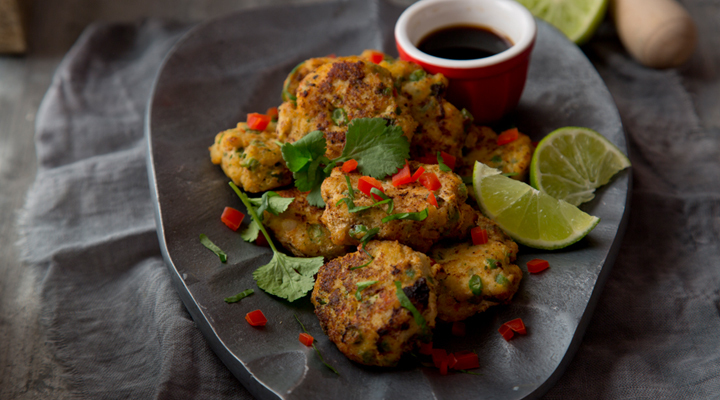 These fishcakes can be used for a Friday night dinner or as nibbles at a dinner party. 1. Place the pepper, spring onions, garlic, coriander, sweet chilli sauce and fish sauce in a food processor and blend. Add the cod and blend again. Add the coconut milk and blend one more time until it forms a smooth paste. 2. Place the mixture in a bowl. Finely slice the green beans into 3mm pieces and stir into the fish mixture. Cover the bowl with cling film and chill in the fridge for at least 2 hours or overnight. 3. Half-fill a heavy-based frying pan with oil and set the pan over a medium-high heat. Shape the chilled paste into small patties with the help of a spoon. Working in batches, carefully lower the fish patties into the hot oil (the oil should reach halfway up the sides of the patties). Fry until crisp and golden brown, turning once during cooking. Remove from the oil using a slotted spoon and set aside to drain on kitchen paper. Repeat with the remaining fish patties.